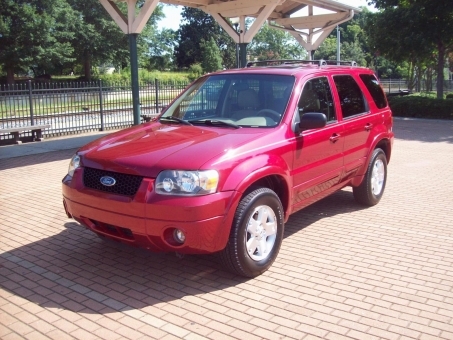 2006 FORD ESCAPE LIMITED 2WD 5-PASSENGER 4-DOOR SUV. The vehicle comes powered by a 3.0L V-6 Engine. Colored in a Redfire Pearl Metallic Finish -G2- over a Tan Leather Interior. Other options and features include: A/C, Power Windows, Power Locks, Power Mirrors, Power Sunroof, Tilt Steering, Cruise Control, Rear Defroster, Keyless Remote Entry w/ Alarm, Factory AM/FM Stereo w/ CD Changer, Dual Front and Side Airbags, Fog Lights, Dual Power Seats, Dual Lighted Vanity Mirrors, Luggage Rack, Traction Control + ABS, Steering Wheel Controls, Center Console, Child Seat Anchors, Factory Carpet Mats, Window Tint, and 16-inch Factory Alloy Wheels on matching B.F. Goodrich Tires. This vehicle has NEVER been smoked in.